My two week solo canoeing trip started after I paddled the Nahanni River in Northwest Territories for two weeks and fished for salmon for a week in Terrace and Kittimat in British Columbia. I flew from Terrace (where the airport security confiscated my camping stove) to Vancouver where I stayed in Same Sun Backpackers for the night - Friday the 13th! I was up at 5:30 the next morning after only managing a few hours sleep due to too many drunken revelers at the youth hostel. From Vancouver I flew to Saskatoon in Saskatchewan and the first thing I noticed was just how flat the place was. There was not a mountain or hill in sight as far as the eye could see! I was lucky enough to hitch a lift with the airport luggage company to the bus station where I boarded a bus to La Ronge in northern Saskatchewan. We had a stop-over in Port Alfred and after another two hours made the last leg of the journey to arrive in La Ronge at 20:00 which was a great relief due to many screaming kids on the bus. That same evening I contacted Ric from the Churchill Canoe Outfitters to organize my pick-up the next day and also add on some bear bangers, bear spray, a tarp and a replacement camping stove of course. The next morning was a Sunday and I went to Northmart to do my shopping which only opened at 13:00 not 9:00 as I was told so I had too much caffeine at A&W while waiting for the store to open. The store owner was nice enough to let me in early and I finally did my shopping. It was also here at Northmart that I met Isabella who was also going to do a solo canoeing trip. She was off to Missinipe and I got some advice from her on running some of the rapids near Missinipe. Ric's boys came to pick me up at 14:00 and after a quick detour via the liquor store we headed off to Nemeiben Lake where I was to camp for the night. After they dropped me off I set up camp and then spent quite a few hours packing all my groceries into various zip-lock bags for the days to come. For the last few days the wind has been blowing very strongly according to some of the fishermen there so I was keen to get going as early as possible to try and avoid the huge waves that can be caused by the wind. My canoe was a red 17ft Prospector and for most of the trip I loaded up the nose and paddled it “backwards” to compensate for the wind - it was only when running rapids that I sat at the back. Monday - Day 1: I was up early at 4:20 to see the fog lying like a thick blanket on the water. The fog together with the lonely cry on a loon gave it a very surreal and eerie atmosphere. I broke up camp and was on the water paddling through the thick mist at 5:20 and that is when I saw it - my first beaver ever swimming right in front of me through the fog. Although it quickly dived down and disappeared once it spotted me. Sunrise was spectacular that day and the sky almost seemed as if it was on fire as the clouds and fog donned a bright orange color in the rising sun's rays. Once the sun rose it turned out to be a lovely day with only a stiff northern wind blowing into my face to compete with which made for slow progress. About halfway across Nemeiben Lake I took out my spinning rod and trolled a lure behind my canoe to see if I could catch some fish that way. It was a fairly successful method and I had managed to hook 4 pike and 1 walleye by the end of the day. I had lunch of scrambled eggs with some cheese on rye bread on a rocky point on the north side of North Bay. From there I paddled north to reach my first portage which was 305m long and in good condition. There had been a forest fire at one point because the trees were charred black and there was a very creepy collective sound coming from them. Upon closer investigation I saw that the trees had been eaten by bugs who discarded what looked like saw dust at the bottom of all the trees. I found the noise made by the bugs very disturbing because it felt like the bugs got under your skin and I was eager to get out on the water again. It was late as I paddled across unnamed Lake No.1 so I decided to set up camp on the north shore of the lake. At this point I was also dog tired after my long day of paddling into the wind. Dinner that evening was one of the pike I caught earlier with some mashed potatoes, followed by a steaming cup of hot chocolate. The mosquitoes were also having dinner which was me so I had to nuke myself with some Muskol to deter the little buggers. During the night it became very cold and I had to get my silk inner out to line my sleeping bag for extra warmth. Tuesday - Day 2: The beavers in Lake No.1 were determined to get rid of their new intruder during the night with non-stop excessive tail slapping which resulted in a bad night's sleep! Groggily I got up at 6:00 and was greeted with another gorgeous view - a thick carpet of fog and a reflection of the forest on the mirror like water. The beavers had mysteriously disappeared but the bug-munching-tree-orchestra starting up again once the sun came out and heated up the trees. For breakfast I had oats with a strong black coffee spiked with Baileys to prepare me for the worst portage of my whole trip. Due to the forest fires the "good" portage route was littered with dead trees making it impossible to use. I therefore had to use the other route which was in terrible condition. For a lot of the time I was knee-deep in brown muck that desperately wanted to keep my shoes as souvenirs. At one point I even fell over while portaging my canoe when I stepped on a log which gave way. I was in a pretty dark mood when I finally got all my gear to the other side. If all the portages were going to be like this one my trip wasn't going to be much fun at all. With this in mind I paddled across the beaver lake to search for my next portage. While I was paddling I heard voices and saw through the grass a few upside down canoes floating in the air. This is how I managed to find the next portage and also meet 2 couples who were just nearing the end of their trip. According to them the next few portages were in very good condition but unfortunately for them I could not say the same for the one I had just done. They were a very friendly bunch and after exchanging email addresses I started portaging. They also mentioned that they hadn't seen any bears as the hunting season was starting soon and apparently the locals have feeding spots to lure them. This portage was in very good condition and very easy going which lifted my spirits a bit. Portage No.4 was also in good condition and it didn't take me long to reach Little Crooked Lake. I was told by the group I met about a very good camping spot on the tip of one of the islands on the lake and even though it was only 13:30 I couldn't resist stopping there to camp for the night. It was a beautiful spot with a great view over the lake and even boasted its own picnic table! After settling in I tried a spot of fishing. In total I caught 7 jacks which I released and I even caught my very first lake trout from the side! That one wasn't going back and it found itself on my dinner menu! The day turned out to be really nice - sunny with a few scattered clouds and a stiff northern breeze. There was not a soul around as far as the eye could see so I went skinny dipping and had a good wash especially after that dreadful portage dredging through the mud. Dinner that evening was the trout with some flavoured rice. My Steripen that I was going to use for preparing my drinking water ran out of batteries so I was left to boil my water from that point onwards and my rental camping stove packed up so I was dependent on fire for the duration of my trip. Wednesday - Day 3: I got up at 6:00 with the water dead calm, again reflecting the forest from the other side in a multitude of greens. It was a beautiful view from where I sat eating my breakfast of eggs and bacon with rye bread and sipping my usual cup of strong black coffee. I really did feel like a king sitting there with my own gorgeous view, eating my food . At 8:20 I was on the water paddling across to my next portage from Little Crooked Lake to Rachewick Lake which was also in good shape. I did however, have a welcoming committee of noisy mosquitoes eagerly waiting for me at the other end of the portage so I had to quickly spray myself with muskol again whilst frantically slapping them away. A low flying plane tail flapped at me when I waved. From Rachewick Lake I paddled up to do my last portage before I finally connected with the old voyageurs route running through Trout Lake. The portage was good and had a deserted indian camp in the middle where I stopped to pick two containers of blueberries. When I started paddling again I found myself in a swamp with a maze of beaver dams all over. In some places I had to get out of my canoe to drag it along and over the edge of a beaver dam and into another. At this point I turned into a young boy again excited by being on a great adventure! I loved every moment of it as at some points I had to stand up in my canoe armed with a paddle in each hand and having to push myself along a very narrow snaking channel in the grass until that disappeared again at the next beaver dam where I had to drag the canoe over the edge. It was however, very hard work and I was happy when I finally paddled out onto Trout Lake. At one point I also paddled past a dead beaver floating in the water. I paddled NE up from the bay and passed a fishing camp, although I couldn't see anyone home. After also paddling past a deserted Indian camp I could suddenly hear the roar of Birch Rapids and I couldn't resist having a look. Birch Rapids were beautiful and I stopped in the middle of them where they entered Trout Lake to do some fishing. A walleye quickly took my lure so it was going to be fish again for the 3rd night in a row. I caught 3 more after that which I returned and found a great campsite just downstream from the rapids where I settled in for the night. That night I had the walleye with mashed potato and came to the conclusion that it was my absolute favourite freshwater fish of all time! Walleye has a very nice flaky white meat and I can only describe it as freshwater cod. So I decided of course that jack's were going back from that point onwards. I saw quite a few pelicans and eagles today with many other water birds and a beaver also swam past right in front of my campsite and slapped its tail twice. That evening there was absolutely no wind and all I could hear was the crackle of my fire, the water birds, some splashing fish, the distant roar of Birch Rapids and the lonely cry of a loon. Everything was so peaceful and I couldn't have asked for a more serene moment. That is exactly why I went to Canada to do my solo canoeing trip and I was definitely not disappointed sitting there with a smile on my face staring out across the water. Thursday - Day 4: I was up at 5:00 and made blueberry pancakes which tasted a lot better than they looked - I obviously needed some more practice making them! I left at 7:00 after breaking camp and soon saw a big, fat beaver sitting on a rock. It quickly went submarine with a very loud tail slap and I didn't see it again. The wind was already blowing at this time and I had to battle with some large waves. Luckily the wind blew on an angle from my back so I could paddle hard and use a pry to ride the waves and this way I covered a lot of distance very quickly. The previous day a couple paddled past me at Birch Rapids and when I saw them sitting at their campsite I decided to say hello. They were a lovely couple from Saskatoon called Isabelle and Andy. They offered me some coffee which I gladly accepted. They flew in on a float plane to start their trip south-east of Birch Rapids and were paddling to Missinipe. From there I continued NE up Trout Lake and did the first portage. The rapids there have a class 4 section and is definitely worthy of a portage! At the bottom of the rapids I couldn't resist making a few casts and quickly caught a small jack which I returned. After I had lunch there, I ran Little Trout Rapid and portaged the last to reach Stack Lake. I portaged the first section of Rock Trout and saw an abandoned canoe on the bank with a hole in its side and a long crack along the bottom. It was the same canoe as mine which was a red 17ft Prospector. Apparently someone tried to run the first section of Stony Rapids and dumped the canoe as it was smashed up by the rocks. After that I ran the second set of rapids which opened up into Mountney Lake. At this point I was getting very tired and started looking for a campsite which were very scarce in that section. At lower Mountney Lake I ran the first rapid and had a few splashes of water over the sides but luckily nothing to worry about. It was just after that rapid that I saw an old campsite straight in front of me and was glad to finally settle in for the night. From my campsite I had a lovely view of the rapids. Dinner that evening was a creamy broccoli and bacon pasta which I ate between the loud bangs of tail slapping coming from the resident beaver. Hopefully it wasn't going to keep me awake during the night! Friday - Day 5: That was one of my happiest mornings of the trip. I was standing there with a steaming cup of strong black coffee, eating a toasted bagel with peanut butter and Saskatoon berry jam while looking over the rapids of Lower Mountney Lake. I was alone in the wilderness with no-one as far as the eye could see and I was experiencing the feeling of true freedom with a grin from ear to ear. I took my time breaking camp and it was definitely one of those 2 cups of coffee mornings. The wind picked up early and by the time I ran the second rapid to enter Nipew Lake it was blowing very strongly. Luckily it was coming from my back so even though there were fairly big waves I covered a lot of distance fairly quickly. At one point I saw a deserted Indian camp and couldn't resist taking a look. There were a few abandoned huts which still had beds and cooking utensils inside. I also saw a playful family of otters swimming past just outside the camp. I saw another beaver as well as many eagles, pelicans, loons, ducks and numerous other water birds. I was still hoping to see a moose, bear or even a wolf if I was lucky enough. Isabella, the girl I met while shopping at La Ronge, told me to run Great Devil Rapids as the portage was long and not very good and then eddy out to only portage the last rapid which was the one with the waterfall. I took her advice and ran the first rapid where I took on a fair bit of water so had to stop to do some much needed bailing. After scouting the next rapid I ran the first section of it on the left side and had to wade the next section due to low water. It was at this point where a mink swam in the water right next to my canoe and it dived and disappeared when I playfully poked it with my paddle. The 3rd rapid I also had to wade and the 4th was a short portage to reach a small lake just below Great Devil Rapids. I might have saved myself a lot of time if I had just done the portage but I did have fun running some of the rapids. I found a very well used campsite on a small island just below the rapids with two random abandoned chairs. At that point the wind was still howling and the temperature dropped a lot - I even had to don my thick fleece to keep me warm. I was also very tired and decided to heat up some water to have a much needed shower. Dinner was tomato soup and rye bread with unhealthy amounts of butter. Saturday - Day 6; In the morning I went to visit the fertilized section of the island and I happened across a very random toilet seat propped up against the rocks. I felt like I was in a 5 star camping resort with my own toilet seat and lovely view over the lake. I used some more of the blueberries to add to my porridge so ended up with blue porridge flavored with Saskatoon berry jam and butter. To accompany that was my usual strong black cup of camp coffee – nectar of the gods. An unsuspecting beaver swam about 5 meters in front of me while I was eating my breakfast. The clouds finally cleared from the day before but the wind started up again fairly early and I was hoping that it wasn’t going to be blowing as strongly as the day before. I ran both of the Little Devil Rapids and apart from a few splashes everything went well. This boosted my confidence for what lay ahead – the mighty Otter Rapids with its class 3 waves! The lake before Otter Rapids were calm and I thought that it was like the calm before the storm…I’ve been advised to run the rapids on the left which is what I did. So far on my trip I’ve been paddling my canoe “in reverse” with the nose loaded to help with the strong winds. With running the rapids I have been sitting in the normal position right in the back of the stern and tried to keep most of the weight towards the middle and back of the canoe to make the nose lighter. Upon nearing the Otter Rapids my adrenalin was starting to pump as I’ve never run them before and I didn’t quite know what to expect. My canoe was also loaded and I didn’t have someone at the bottom to pick me up if I ended up going for a swim! With this going through my mind I started paddling hard straight towards the rapids to gain some speed. My canoe scraped over a few rocks and then I got in the current with the waves crashing all around me. Everything happens so fast – at one moment you are paddling like crazy and the next you pry the canoe as hard as you can to keep the nose straight! All of this while your canoe crashes up and down the waves in a moment of pure exhilaration. I made it down the rapids in one piece with the adrenaline still coursing through my veins. It is a feeling that I can’t describe and is best experienced for yourself! From there I paddled the long way down to Ric’s shop in Missinipe to go and settle my bill and do some more shopping. There is a restaurant situated inside Thompson’s charters building and I went in there to order myself a nice burger with chips which I washed down with a couple of beers. It tasted so good after only eating camping food for the last 6 days . After buying some fresh fruit and veggies at the store I went to settle up with Ric. I really liked Ric – not only was he a great guy but he was also a wealth of information when it came to the Churchill River. He suggested a few changes to my route as well as a few good camping spots. After leaving his shop I got back in my canoe to start the second leg of my trip. From Missinipe I paddled up into Grandmother Bay and portaged my gear to enter the French Lake. I found a campsite on a small island near Mason Bay and settled in there for the evening. When I had my burger at Thompson’s Restaurant I spoke to the owner and he gave me some tips on how to catch walleye. The trick is to always fish your jig hard on the bottom. This can be achieved by casting out and waiting for your line to go slack. That would indicate that your jig reached the bottom. Give your jig a quick twitch, reel in a few times and wait for your line to go slack again. Repeat this and you’ll be sure to have some nice fresh walleye for dinner! I hooked 5 walleye and 2 jacks in about an hour after setting up camp all of which I released. Dinner that evening was toasted bagels with cheese, peanut butter or jam followed by a cup of tea with cookies for dessert. Sunday – Day 7: During the night the wind picked up and it rained a few times. It was also fairly cold and I had to don a few extra layers of clothing to keep me warm. By the next morning the rain had at least stopped but the wind was still blowing strongly. After a breakfast of muesli and coffee I broke up camp and set off to try and reach the second portage. It was very slow going with a strong easterly wind blowing straight into my face but I persisted. |Upon rounding a bend I was suddenly exposed to the full fury of the wind which blew down through a channel in the trees. I paddled as hard as I could sometimes having to pry hard to try and keep the canoe’s nose straight but I was either standing still or being blown backwards. A few times I got blown sideways when the wind caught the nose of the canoe and then big waves would crash against the gunnel splashing water over the side. After exhausting my entire vocabulary of swear words I had to admit defeat and paddle back to a good camping spot I saw earlier. I set up camp there for the day and was suddenly left with lots of time to kill. To cheer myself up I tried some fishing and caught a big walleye on my first cast which lifted my mood a bit. This one I splayed open on a forked stick with two side supports – the way the Indians used to do it. \I also caught 4 jacks which I returned. To kill some more time I did some carving on a piece of bark that I brought back from my Nahanni trip. I had an idea for this one which was to shape it into a paddle and have the blade in the shape of a beaver tail due to a few nights of very little sleep. That evening I roasted the walleye on the fire and with it I had some garlic baby potatoes. The wind finally died down in the afternoon and I was just hoping that it wasn’t going to blow again the next day. Day8 - Monday: It rained again during the night but at least I woke to a dry morning. There was no wind and I could clearly hear every sound coming from the forests and the water birds. It was indeed very serene and the water was flat like a mirror. Breakfast was my blue porridge again with coffee. I set out at 9:20 gliding over the calm surface towards the 2nd portage on French Lake. The weather didn’t hold and soon the wind picked up again. I read about a very good campsite at the end of the portage with good fishing which I wanted to check out. After my first portage I took my fishing rod for a quick dangle where the stream entered the lake and quickly caught a few small walleye. While retrieving one of them a monster pike came and grabbed it so I was fighting two fish at the same time! Eventually it let go earning him the title of the big one that got away and I released a very shaken walleye to go and tell his buddies what just happen to him! It suddenly started raining – slow at first but then it intensified until it was coming down in buckets. For the first time I had to quickly set up the tarp to keep all my gear dry. I also had to dig little tranches to drain the water away which was starting to collect under the tarp threatening to swamp my gear. When the rain finally slowed down a school group used the portage and carried on south towards Rattler Creek. Another group of 4 kayaks paddled up to the campsite and turned around when they saw my tent although I wouldn’t have minded sharing. Making a fire that evening was a struggle to say the least with all the wood very wet from the rain. I was left with only matches after one lighter ran out of gas and the other melted when I kept it alight for too long. In the end I had to hunt around for fallen birch trees to collect the dry bark on the bottom side for kindling and after some colorful verbal support I finally managed to fry my steak with mushrooms and onions which was definitely worth the hassle! The rain at least stopped for the day although the clouds were still pregnant with the possibility of rain and it was also very cold with the ever present wind still blowing. I caught a total of 8 walleye and a jack at that spot all of which I returned. Day 9 – Tuesday: That night the weather turned from bad to absolutely miserable. The wind was howling and it rained all night long. It was a good thing that I checked on my tarp in the middle of the night. Water got trapped in one of the corners causing it to sag and it probably would have torn the canvas if any more water had collected! In the morning the rain had stopped but the wind was still blowing strongly and I had to put my thermals on for the first time to try and keep warm. Breakfast was scrambled eggs with toasted bagels and my much loved cup of strong black coffee. I started paddling at 10:20 heading south towards the 3rd portage of the French loop. The portage was in good condition and from there I paddled towards Rattler Creek. There are some old aboriginal rock paintings at Rattler Creek which were in good condition and I could make out a beaver and what looked like a deer. From there I paddled the last section of the French loop and then hugged the north shore heading west towards Stony Mountain Portage. Ric told me about a really good camping spot between the 1st and second portage on the north side which was my destination for the day. The wind was still blowing strong and I had to compete with some big waves at times. At least the Prospector was a sturdy beast and with the wind on an angle behind me the going was good. This part of my trip was a detour from my original route so I went in blind as I didn’t have any information about the portages. At this point I was using my compass and map only and when I reached the portage I chose the wrong side and had to reload all my gear to get to the north side. The rapids there were big and probably class 4 with a fall at the lower section so there was no way I was going to run them! The campsite was indeed very beautiful with lots of space and flat rocks which could act as a working surface and also a lovely view over the lake with the rapids at the top. During the day the clouds eventually cleared although the wind still persisted until it finally died down during the evening. At one point I got the fire going and heated some water for my shower to have another much needed wash. It is amazing how a hot shower can boost morale. That evening turned out to be lovely with no wind and clear skies and there was a bright moon rising over the tree tops. Dinner that evening was flavored rice with the last of my fresh mushrooms followed by a nice cup of hot chocolate. Day 10 – Wednesday: I had planned this as a layover day which was a good thing. I struggled to get up in the morning and my muscles were aching from 9 days of non-stop paddling. For breakfast I had blueberry pancakes with syrup and my usual cup of coffee. After breakfast I washed some of my clothes and also tried some fishing but was unsuccessful on this occasion. The weather was cloudy but warm with a light breeze. I saw many eagles and other birdlife but the moose and bears still evaded me. Later during the day I took the canoe for a paddle to check out the rapids and try some more fishing. I caught 3 pike of which one was pretty big and kept a small one for dinner later. It stayed cloudy all day and a few drops of rain fell but nothing serious and a gentle breeze blew all day. I haven’t had any trouble with the bugs lately which was a good thing! Dinner that evening was pike with mashed potatoes. That night I went to bed early as I wanted to try and reach Nistowiak Falls the next day. Day 11 – Thursday: I was out of bed before 6:00 and rose to a very foggy morning. The fog lay like a thick carpet on the water and I could just make out 2 big fluffed-up pelicans sitting on a rock just in front of my campsite. Once the fog lifted a bit they had no intention of staying for coffee and took off. I had a very quick breakfast of muesli and coffee and managed to get away for 7:20. I quickly ran the first set of rapids which I scouted the day before but had to portage the second set as they had falls. From there I had a nice clear run with no portages all the way down to Stanley Mission. It was overcast all morning and an easterly wind was staring to pick up as I paddled along to Stanley Mission. I managed to get sufficient protection by hugging the west shore of the lake. I reached Stanley Mission at about 13:00 and wanted to do some shopping but I was too nervous to leave all my gear alone on shore and paddled straight to the church. The church is the oldest building in Northern Saskatchewan and in beautiful condition. The door was unlocked and I was able to get inside and have a look. After signing the visitor’s book I took a stroll outside along the cemetery and saw some old and interesting tombstones there. From the church my aim was to paddle all the way to Nistowiak Falls where I intended to set up camp for the evening. I started paddling towards the falls but “the beast from the east” was yet again blowing strongly and defeated me. My arms were getting very tired paddling straight into the wind and it was a welcome break when I finally reached the rock paintings. The rock paintings were in good condition and after I took a few photos I headed off to try and reach Nistowiak Falls. At Little Stanley there was a lovely portage with rollers that I could use. I lined up my canoe and paddled hard onto the rollers only to roll back again with the current dragging the stern towards the rapids! I had to quickly jump out of the canoe and drag it to safely before the things went horribly wrong. It would have been a better idea to get out just above the portage and drag the canoe onto the rollers! While portaging at Little Stanley I came across a few very good campsites and decided to set up camp there for the night. There was a fairly large lake to cross just after the portage and the beast from the east would have made it very hard going. The campsites there were very good and had level grassy areas with a picnic table and even an outhouse for those who could brave it. With the wind of late I was getting edgy about crossing Lac la Ronge which is a very large lake which can produce massive waves that could swamp a canoe. I was hoping for a few good days towards the end to make that journey. To cheer me up I had some tea with cookies and macaroni cheese fro dinner. Later I saw a boat run Little Stanley and a group of Cree lads docked their boat to try and catch some walleye. They told me that they’d been collecting berries during the day but they didn’t stay for much longer. Day 12 – Friday: I was woken at 2:30 by a storm that blew with a fury such that I haven’t felt in a long time. I had to get out and fit more tent pegs for extra support because I was scared that the wind would rip my tent apart! At 5:30 the gusting wind shook my tent so violently that I was forced to relocate further into the forest where there was slightly more protection from the wind. I managed a few more hours sleep after relocating. The rain also started earlier and the day turned out to be really dreadful. It was pretty obvious that I would be wind bound again so I took my time waking up. At the time I calculated that I needed at least 3 days of paddling to reach La Ronge. I had a total of 4 days left but if I was wind bound again for the day that would leave me with no extra days if the wind did end up blowing when I tried to cross Lac la Ronge. I was surprised when the wind died down around 10:00 and after some speedy packing I managed to start paddling at 10:40. There was still a stiff easterly wind blowing straight into my face but at least I could still slowly make up ground. Nistowiak wasn’t that far from Little Stanley Rapids and I knew that once I completed the portage at Nistowiak Falls the easterly wind would be at my back and help me along towards Rapid River. After some hard paddling I finally made it to Jim’s Fishing Camp which is also the start of the portage trail. I bought 2 steaks, eggs, bacon, fresh bread and a can of beans from them and also had a nice cup of strong black coffee to get me ready for the really long portage that lay ahead. Just after I made my first trip I came across some luggage at the other side of the portage and felt a little nervous when I also saw a shotgun just lying there unguarded with no one around. I also made a detour to see the falls which were big, aggressive and absolutely beautiful! It took me 3 trips to get all my gear across and I was a broken man by the end of it – Nistowiak Falls Portage was hard work! I never saw who the luggage and the shotgun belonged to. The dogs from Jim’s camp had been following me all the time I was doing my portage and they were sad to see me get into my canoe and kept running after me along the bank. Upon nearing a bend on my way to Rapid River I was very startled when I was confronted with a head wind - the wind was blowing east earlier and should have been on my back but I discovered that it had changed direction while I was portaging! The wind was yet again blowing very strongly and I tried a few times to paddle around this particular corner only to be blown back. It felt at the time that the wind was determined to screw me over and stop me from reaching La Ronge. While I was attempting my 3rd go I suddenly looked back to see the dogs swimming after me and they were out about 50 meters in the water already! I was really scared that they were going to drown so had to paddle back and yell blue murder to make them turn around. They finally swam back and I finally managed to round the bend on my 4th go but the wind was blowing so strong that I was standing still even though I paddled as hard as I could. Finally the inevitable happened and the wind caught the canoe’s nose and swung me around – I had no option but to turn around and set up camp at the end of Nistowiak portage. While paddling back I finally managed to see the mystery man sitting alone and staring out across the water. He was sitting there with his shotgun in his hands but I was too tired to care at the time and went to say hello and to see if he posed a threat. He was a Cree man called Isiah and there was nothing to worry about as he was only waiting for his brother to pick him up. The shotgun was for any ducks that happen to fly past while he was waiting. His brother was called Roger and he had a cabin and a trapline just across the lake and was going to pick him up around 18:00 so I offered him some tea which he gladly accepted. He told me that he was from Stanley Mission and worked as a part time guide and that him and his family were going to spend the weekend with his brother. Roger did finally turn up and I found him to be a friendly guy too. After they hauled in some more heavy artillery I breathed a sigh of relief to see them leaving with all the guns and cooked myself a nice steak along with sautéed baby potatoes. Roger told me that the wind was always calm the day after a storm so I was looking forward paddling on a calm lake the next day. Day 13 – Saturday: I found myself at 6:10 in the morning sitting in my canoe already defeated by the wind. It felt like déjà vu when I tried to round that same dreadful bend and was met with the same fierce westerly wind I encountered the afternoon before. With Roger’s words still echoing in my ears about no wind the day after a storm I sat there livid with a rage that words won’t do any justice to nor would it be suitable for reading! Desperation was slowly creeping in as I realized that I was running out of time due to the strong winds and at that moment I felt really despondent and all I could do was turn back - yet again. With another wind bound day I was left with only 3 days to paddle from Nistowiak Falls all the way to La Ronge which would be taking a serious gamble. I decided to get my gear ashore again and walk to Jim’s camp to try and find out what the weather was going to be like for the next few days. Arriving at Jim’s camp they couldn’t help me with the weather forecast but they were nice enough to lend me their telephone so that I could phone up Ric and ask him what he thought I should do. Ric told me that the forecast was for strong south westerly winds for the next few days with rain and that it was also going to be cold. That pretty much confirmed what I already thought – there was no way that I was ever going to be able to cross Lac la Ronge and I had to make other plans. I decided to take my time paddling back towards Stanley Mission and have Ric pick me up from there. We decided on Wednesday 13:00 and with that settled I was finally able to relax and enjoy my trip again. I got myself a breakfast of egg, bacon, toast and coffee at Jim’s camp and after that walked back to the other side of the portage to set up camp again accompanied by the same two friendly dogs. During breakfast I saw some of the fishermen there and they looked the worse for wear after mass consumption of beers during the previous day’s fishing. Apparently one of them was so drunk that he fell overboard when he chucked his lure out! Needless to say they didn’t have a big appetite that morning but they were big friends with the coffee pot! On my way back to camp I saw an otter swim upstream with a fish in its mouth. For the rest of the day I busied myself setting up camp, collecting wood, fishing and I also portaged the canoe back to Jim’s camp. On my way there I was stopped by a massive tree that got blown over by the strong wind and had to break some branches off and drag the canoe underneath to carry on! At Jim’s camp I spoke to another Cree local called Big John who told me about some local delicacies, including moose nose and gums and beaver tail and liver. Definitely not something you see on an everyday menu! Back at camp, Roger and his wife walked past and I made them both a cup of tea. After they left I heated up some more water for another well needed shower which I had while standing there naked overlooking the first set of rapids at the top of Nistowiak Falls. After my shower I took a walk back down to Jim’s camp to try a spot of fishing and only hooked one pike who spat my lure out when it jumped out right in front of me. Walking back to my campsite I counted a total of five trees that had fallen over the portage trail due to the strong winds! Dinner that evening was the other steak accompanied by a can of baked beans. The wind blew strongly all day long, with a few sunny spells and some rain at times. Day 14 – Sunday: With the mad rush over I was able to relax more and I slept till 8:00 that morning. I made a huge breakfast of eggs, bacon and toast, and it was another 2 cup of coffee morning. The wind turned north that morning so I decided to paddle towards Stanley Mission and find a campsite nearby ready for when my shuttle arrived. I still had two trips to complete my portage and was on the water at 10:30 with the north wind in my face to slow things down yet again. Luckily most of that section I would be paddling westwards. I’ve seen many Canadian geese flying south – sometimes in a gaggle of 100 plus! They are very noisy and always fly in a V-formation. The nights were also getting very cold and the leaves were starting to change color and drop. The wind waited patiently for me to start to paddle and promptly changed direction to south east when I had to cross a big lake – yet again I had the wind in my face! I paddled all the way from Nistowiak Falls to the Stanley Rapids and then past the rock paintings where I started looking out for a campsite. Campsites in that section were few and far between but I finally managed to find one where there was a fork in the river on a rocky outcrop with a view over Stanley Mission and the church. My dinner that evening was a creamy bacon, cheese and broccoli pasta with a nice cup of tea. I tried my luck at some fishing and managed to catch 3 jacks and a walleye which I kept for either lunch or dinner the next day. A Cree guy called Joe anchored his boat in the rapids near me to do some fishing. He worked as a dentist in town. He asked me if I had had any trouble from the “punks from town” which luckily I hadn’t but apparently it could be an issue at times. He also told me that there were about 2000 people living in Stanley Mission and that unemployment was very high. A lot of the locals work as guides during the peak season. According to him Nistowiak means “where the three rivers meet” in the Cree language. At 11:00 it was already dark and I heard rustle outside my tent and I went to investigate. The culprit was a large-eyed rabbit sitting there, not overly bothered by me at all. During the night I heard many more feet but didn’t think much of it at the time. Day 15 – Monday: That night I slept pretty badly due to the non-stop scurrying of feet all night long. It Definitely wasn’t just a rabbit and it continued pretty much all night long. I used the last of my blueberries to make pancakes again and had them with maple syrup and a strong coffee to wake me up. The day was pretty relaxed and I collected some firewood, cleaned camp, whittling and some more fishing. I caught a total of 3 more walleye, one of which is called sauger which is a relative of the walleye. A normal walleye is easy to distinguish due to a white spot on the tail where as the other hasn’t and instead has black and yellow markings on the fins. The weather that day was overcast with a slight breeze – I’m sure the wind would have blown stronger if I was paddling. I found it amazing how many birds you could hear at any given time. Bald eagles, loons, ducks, Canadian geese, kingfishers, jacks and many other smaller birds. Sometimes it would go dead quiet until the serenity was disturbed by one of the ever present motorboats from Stanley Mission. My campsite at the time was absolutely littered with the spent cartilages of shotgun shells – I’m guessing the locals used that spot a lot for shooting ducks. I was getting sad knowing that it was my last night of camping when I started packing all of my rental equipment into the barrel that evening. That evening I fried the walleye fillets from the one I caught the night before and also had some sautéed baby potatoes to accompany it. I can now safely say that walleye is my new all time favorite freshwater fish by a million miles! Pike was also a first for me on this trip but it is definitely not as nice as walleye and they also have a funny Y-bone which I’ve never come across in any other fish. With a nice full stomach I went to bed at about 11:00. It all started with absolute silence, then I would hear a rustle in the forest followed by approaching footprints which came right up to my tent and then silence. Whatever was out there was obviously sniffing and checking out my tent! Whenever I moved my stalker would quickly race back into the forest only to return again in a few minutes. Once I got up and shone my very weak headlamp out into the forest but whatever was out there stayed just out of sight. Back in my tent it didn’t take long for the footsteps to approach my tent again. At one point I thought I would wait until the animal approached my tent again and then shout really loud to hopefully scare my stalker off – it didn’t! It was back in less than a minute and that was when I got really worried. Whatever was out there was not scared of me! The footprints were definitely not that of a small animal as it had a longer stride and sounded like that of a dog. The only animal that I could think of that is agile and quick, hunts in a pack, has a long stride like that and has enough power to rip out my tent peg support must be a wolf! Things didn’t look good at the time as I was alone with no firearm and a very weak little headlamp and I also realized that I had packed my bear bangers and spray in my food barrel that evening before I went to bed! My stalker was back outside my tent again and I could hear the others from various locations – I will be honest and admit that I was truly scared at that time. The stalker outside was getting more persistent and could probably smell my fear - I knew that I was in serious trouble. This animal also knew that I was alone and that it had its prey cornered. I just knew that soon it was going to strike! That is when I knew I had to make a move. I crawled out of my sleeping bag and quickly put on my shoes and fleece and stepped outside. As before my stalker retreated to the forest but at the same time I could hear the others from various angles! I quickly walked over to my food barrel and with shaking hands dug my way to the bottom where I had packed my bear bangers and I was just hoping that whatever was stalking me wasn’t going to charge! I’ve never used a bear banger before and after ripping open the packet I was confronted by two types of cartridges. Some were red and the other ones were larger and orange. After quickly scanning the instructions on the packet I grabbed an orange one and screwed it onto the launching pen, all the while feeling many pairs of eyes training on me! My thumb pulled the trigger back and I let go. The firing pin hit the primer sending the bear banger off into the air and all of a sudden it exploded with a mighty bang which I’m sure woke a few of Stanley Missions residents! My stalkers quickly disappeared in a flurry of footsteps and all I could hear was my ears ringing. I wasn’t sure if my stalkers might be back so I quickly moved my canoe to the water ready to paddle off and seek safety in the Stanley Mission church! Somewhere I once heard that wolves are scared of fire so I started up the fire again. While the fire warmed me my nerves slowly started to settle down and it was after sitting there for about half an hour, I suddenly heard the distant crying of wolves which really chilled my blood. I only had one more bear banger left and could only hope that the wolves would not come back for me – luckily they never did. I was sad that my trip was finally over as I had found Canada to be such a beautiful country. I was going to miss the multitude of water, the evergreen forests, the serenity, the campfires, the fishing, the people but most of all the absolute feeling of freedom! It is a feeling that I can’t describe in words but rather one which you have to experience in person while paddling over a calm lake or sitting next to a campfire with the soothing sound of the river in the background. I will leave Canada with a feeling of awe and wonder and will forever long to paddle again in this spectacular wilderness. Really enjoyed your trip report Craveman. You have a humorous style of writing that is easy to read. Glad you managed to make it out to the Churchill River. Last year we really enjoyed our trip in the same area that you went this year. Never noticed any areas on our route with recent forest fires. Did it look like something that happened over the past year? Did you ever find out what critter was terrorizing you in your tent the one night? We had an incident this past summer in Lake Louise where I woke up in the morning thinking someone was throwing rocks at my tent. There were these occasional thuds on the tent and in the vicinity of the tent that went on and on for quite some time. I finally got fed up with it and exited the tent to tear a strip off of whichever kid happened to be nearby, and all I saw was this guy. He was up in the tree throwing acorns down around us. Are you sure your critter was not something similar? Anyway, for those who may not remember, here is a link to all of the discussions that went on prior to your trip. 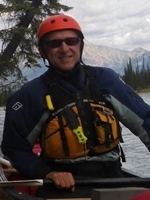 Thanks for a great report, the Nahanni one too. .... I boarded a bus to La Ronge in northern Saskatchewan. We had a stop-over in Port Alfred and after another two hours made the last leg of the journey to arrive in La Ronge at 20:00 which was a great relief due to many screaming kids on the bus. I'm FINALLY getting around to reading your trip report Leroux. I gather that Port Alfred should be Prince Albert. Day 2 and your stove and water sterilizer both die? Yikes! I think we likely camped in the same spot on Trout Lake (Day 3) below Birch Rapids, on the small narrow island. We did not find fish though we also tried below the rapids. It was pouring down rain when we were there and we were really hoping for some fried walleye or pike to warm us. We also stopped in at the Robertson Trading post in La Ronge after our trip in September. Wow, what a place! Friends have been telling me for years that I need to stop in there but we are always rushing to the river or rushing home again. This year we made the time to stop. Thanks for the report and I hope you are enjoying the rest of your adventures.